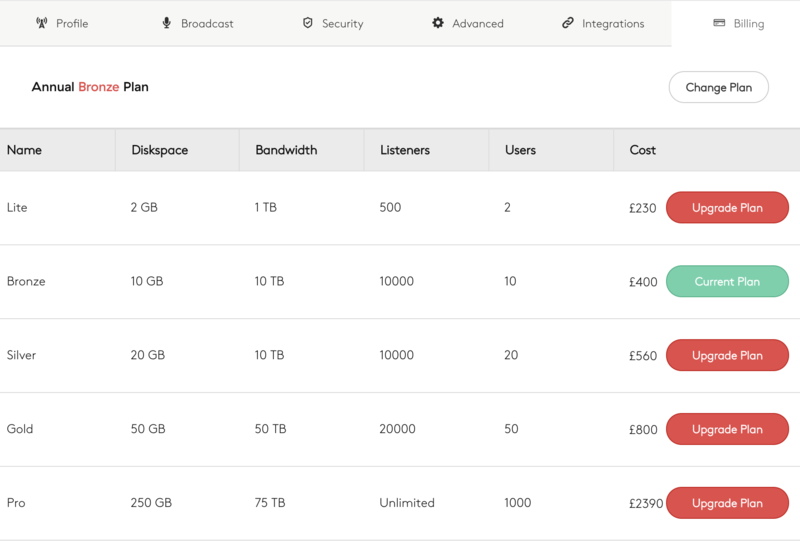 You can upgrade or downgrade your plan at any time from within your Radio.co dashboard. Log in to Radio.co under your stations admin user. Go to Settings > Billing. This will show your current plan details. In this example, we are on the Bronze Plan. Click the 'Change Plan' button at the top of the page. This will display your upgrade/downgrade options. Choose the plan you would like to move to and click either Upgrade or Downgrade. A confirmation box will appear. If you are downgrading, your service will remain on the current plan until the end of this billing period. You will then be moved to the lower plan and charged the lower amount.